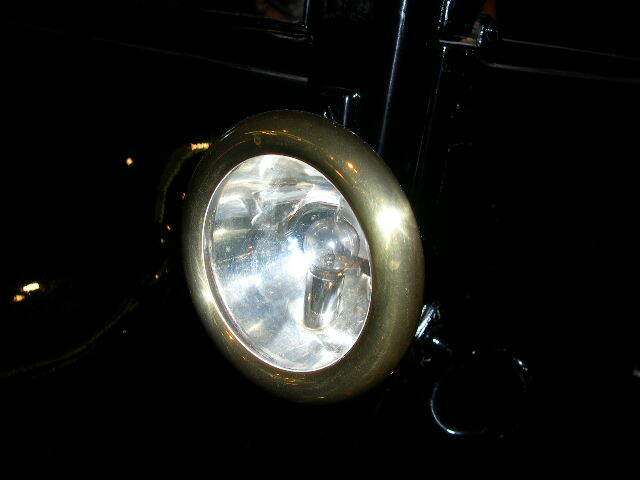 I like the look of side lamps on black-era Ts, but to be a little different, I'd like to put a set of accessory electric side lamps on my '23 touring car. It seems to me that those would be items that early '20s Ford buyers might have bolted on to their new cars. At Hershey last October, I walked the whole show and found just one accessory electric side lamp - "NEW TYPE," pictured here. It has a 4.75" clear bullseye lens. There's an ad for these shown on page 213 of the Clymer book. 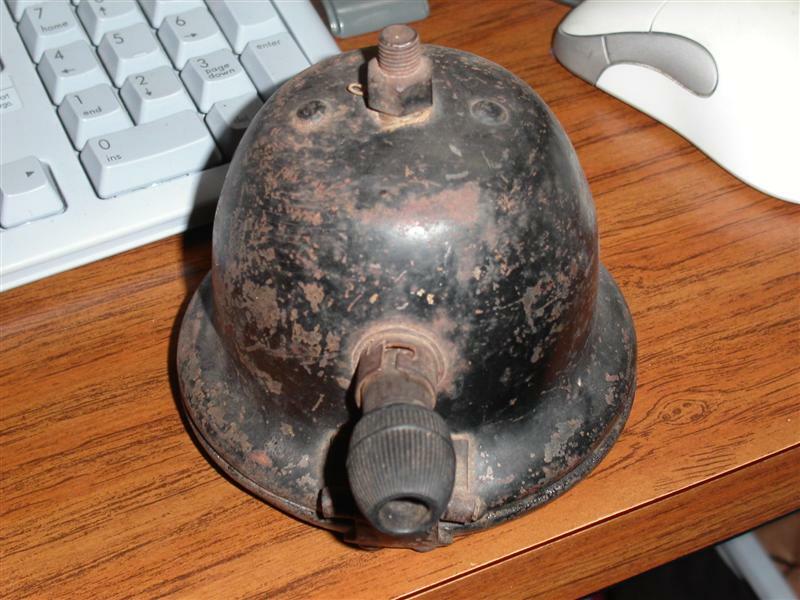 It fits onto the "ears" of the lamp brackets just like the kerosene lights. 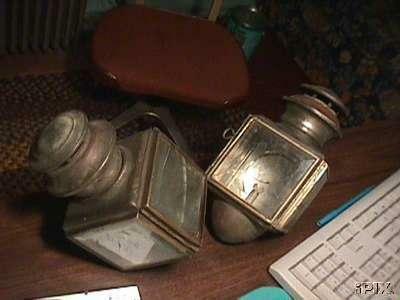 Does anybody know anything about these lamps, and most importantly, does anybody have an "orphan" one they'd like to sell to me? I'm told they were very popular in Canada,try our Northern friends. Here is another photo of this "New Type" accessory side lamp. These seem to have appeared around 1915. I will probably paint the brass rim black when and if I use this though. Rick, does the back-end of the lamp have at least 2 rivet heads that are exposed to fit within the recesses of the kersone bracket, so that the body stays fixed and does not rotate? 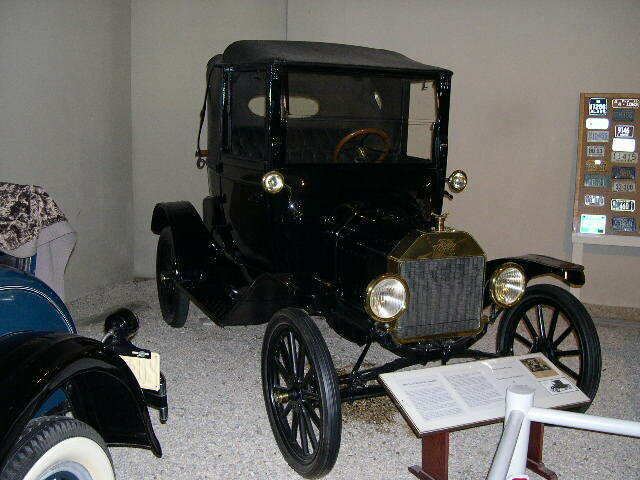 The 1915 Coupelet in the Museum of Automobiles on Petit Jean mountain in Arkansas has a set of lamps similar to those. I also bought one of those lights at Hershey. One man from Indiana collects them and told me that he has identified 8 different electric lights, but not the manufacturers, most are Canadian. 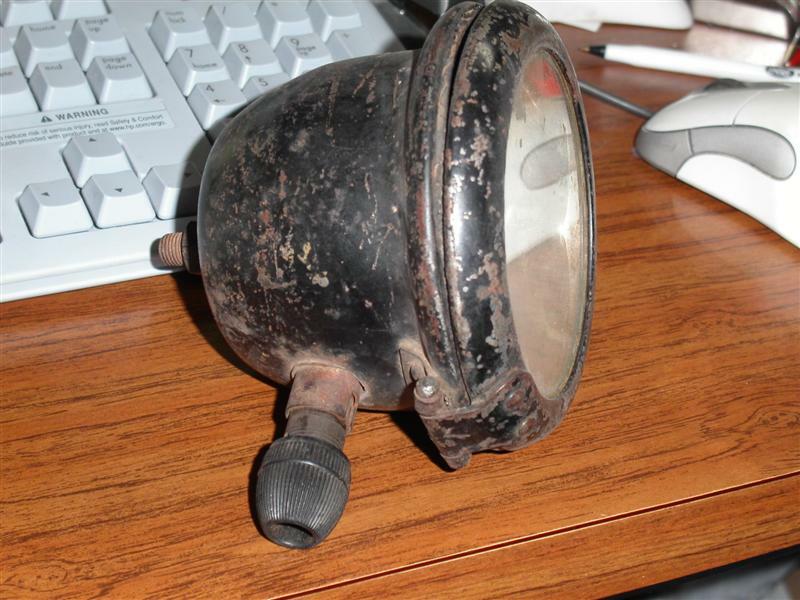 The light I bought was soon traded for a pair that look identical to the kerosene lights, without the tank and top vent areas. The guy I traded with had one like it for 14 years and never found another one. They are shown in an ad in Clymer's book. The brass bezel does suggest an earlier than 1916 light. The lamp I bought had a steel bezel and the two bumps on the back. The bezel had a hole on top and one on the bottom for attachment, similar to the one above's atachment. 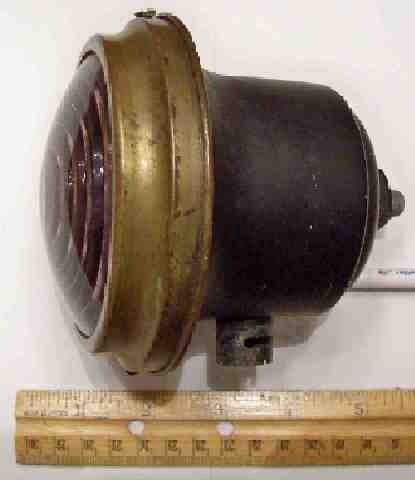 The lamp frame had a dimple on the top and a 4-40 screw on the bottom held the bezel in place. I found the pics of the one at Petit Jean. Thanks for the info. I think I remember looking at the electric cowl lamp that you eventually bought at Hershey. Your description is the same, anyway. It wasn't an exact match to the one I had found previously (pictured above) so, I passed on it. A few hours later I decided it was close enough and ran back to buy it, and it was gone...now I know who bought it! But if you come across another orphan one anywhere one give me a call - collect. I think you are right, these probably came out in the mid-1910s. But I do like the shape of them. 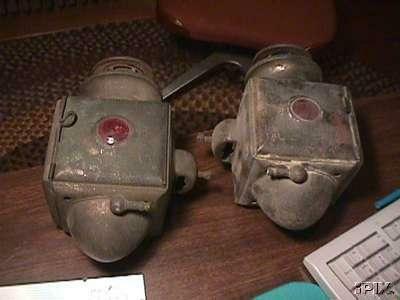 On the final day at Hershey I found a set of electric cowl lights like the one's you traded for - they look just like the kerosene lamps, but have no reservoir or chimney. They don't have any manufacturer's marks. I think I paid $35 for the pair. Thanks for posting these pictures. Those are very elegant lamps. I wonder why the Canadians were so enthused with electric lamps on their Ts? (As reported by Jack D and others.) Maybe getting in and out of the car to fill/light the kerosene ones during the long cold weather seasons was a factor. Nah, that doesn't make too much sense. Any ideas? The ones on the T at Pettit Jean make me think of one I have: it's engraved "Made for Cadillac by Gray & Davis," and dates to 1913. I bought this pair of brass acetylene sidelamps on tbay several years ago. 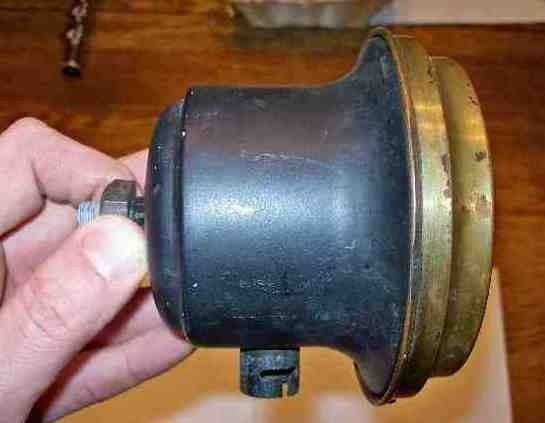 They may have been used instead of headlamps early on, most likely on a French car. The lenses may have cracked from having the flame too high. Seems like I read somewhere that those lights were popular in Canada because the laws said they had to have them. There was a nice book published about 15 years ago on Canadian Fords. I wish I knew the proper title and authors name. I actually met him in Hamilton, Ontario, but I can't remember his name. Yes - it sure does; you were with me when I found it during the Great Hershey Quest. My darn feet still hurt! I can't wait to look for a matching one next year! LOL. Say, did that crankshaft turn out OK? Well, the legal requirement for the electric lamps sure would explain why these are seen more on Canadian cars. Or were, rather. 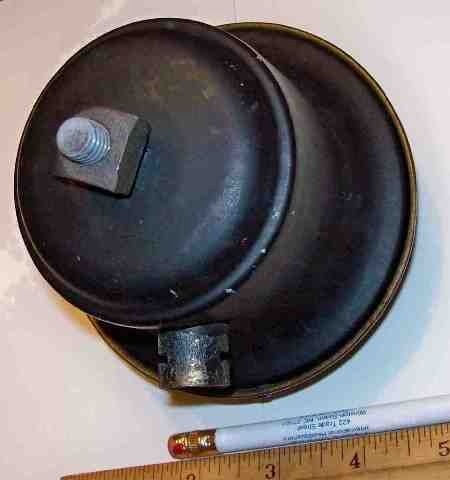 I guess I'll have to hit some Canadian swap meets...I would like to find a match for this lamp and put them on the car. Gentlemen, thanks for the input! And my sore legs! However, seeing the entire Hershey swap meet in two days (on foot) is a pleasant experience I won't soon forget! That crankshaft magnafluxed OK, and cleaned up at .030 under. Not the best outcome, but I've seen worse! I hope you find a mate for that lamp - I'll be sure to help you look for one next year! I got this one off of T Bay. It has the two rivits that corespond to the two detents on the bracket. Rick, a guy in Holland has a pair of these lights like you have on a website. 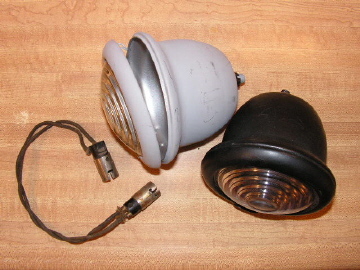 Go to http://www.style-e-auto.com/pages/Part/Style-e-auto-com-Part-toonPartDetails/579 392-041-side-lamps-unmarked.asp to view. Bob's light is just like the pair that I have now. The electrical connection is very similar to the regular headlight connection and is held in place with a small metal screw. The connector may have to be soaked with penetrating oil for a day or so to remove it, after the screw is removed. The glass on mine is clear and like the regular oil cowl lights have, although it don't look that way in the photo. Page 213 of Floyd Clymer's book, Henry's Wonderful Model T 1908 - 1927 shows five of the light styles my friend mentioned. Most have no manufactures information with the ads. Yes, those are neat. Thanks for posting the pic. Hopefully I'll be able to find another one like mine (pictured at top of thread), and complete my set. And hopefully before 14 years rolls by, as with that other fellow you mentioned. There's got to be another one sitting on a self in someone's garage or barn. In the meantime, now that you're set...if you happen to find another pair like yours (above), I would love to know about it. You just can't have too many Model T electric cowl lamps.